Wayfaring Wanderer: Greeting from Fairford! 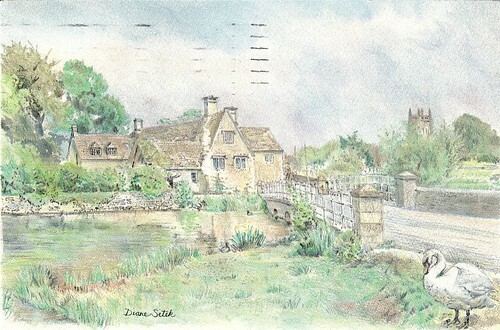 I received this psotcard from Fairford, a small town in Gloucestershire, England. 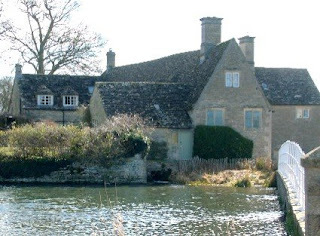 Ancient times: Fairford, first mentioned in written records in AD 850, gained its name from the Saxon "Fagrinfordia", which means "fair" (easy to cross) ford. The ford was an ancient crossing place for the river Coln, before the town bridge was built in the 13th century. In 1787 the river was excavated, making it much deeper and narrower. 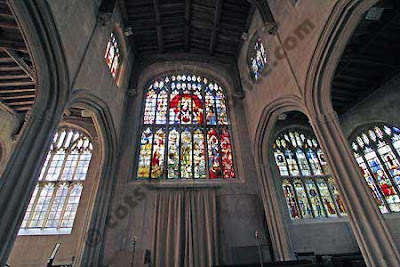 Places of interest in Fairford include the beautiful St Mary’s Church, noted for its world famous stained glass windows, probably one of the most spectacular displays of stained glass windows in the Cotswolds. I found a website with some beautiful photos of the church if you want to see more. and HERE for more history of the church. Gorgeous! Imagine if you got up every morning to look out the window to that. 1218: It's such a quaint looking town, finding the info on it was sort of fun! a little bird: this is a postcard I received from a swap I did. I don't live in England. I'm in NC, however. I do love where I live!! My goodness, Fairford is about a 20 minute drive from where I live. It is a wonderful and historic town, with some amazing scenes. I'll no doubt be visiting there soon, so will be sure to take some photographs on my way through - so that you can see more of the wonderful place. Hey Jessica, I hope you are having an awesome weekend. I was just thinking, I am going to be on my travels again during this year and wondered whether you would like to do a postcard exchange? If you do, then please feel free to drop me an email to exchange addresses.